After finishing Q3 with solid year-to-date gains, the S&P 500 took a volatile turn lower starting in October, and has only recouped some of those gains through November (the S&P was up 1.85% in November). 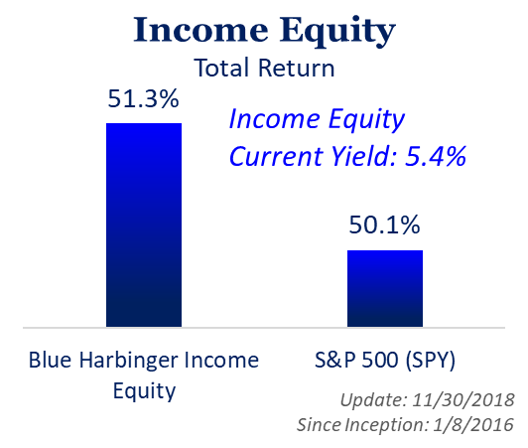 Our Blue Harbinger Disciplined Growth portfolio gained 2.9% during the month, outpacing the 1.85% gain for the S&P 500, and continuing its long-term track record of outperformance. As a reminder, this strategy is designed to achieve long-term capital appreciation. We expect volatility in the strategy (it'll be up and down from month to month because it has a significant amount of beta market exposure--but we believe it'll continue to be up very significantly in the long-run--because of its market beta and its attractive security selections). 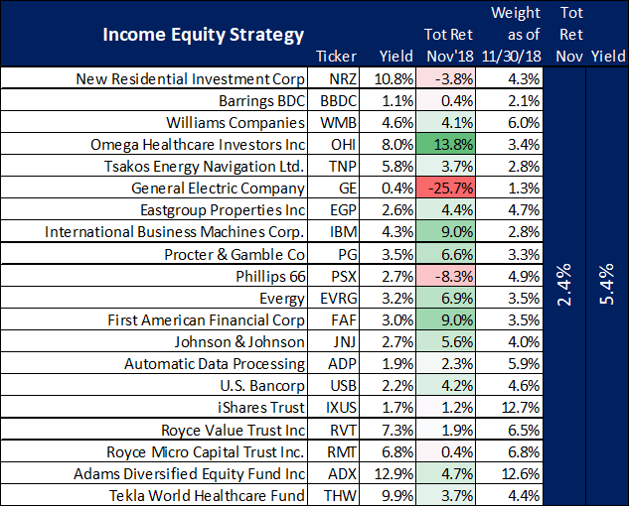 Our Income Equity strategy yields 5.4% and gained 2.4% in November, thereby outpacing the 1.85% gain for the S&P 500. This strategy has a little lower beta exposure than our Disciplined Growth strategy, because it focuses on many higher income securities with somewhat lower volatility. However, it still has a significant amount market beta exposure (which we like, because markets go up in the long-term... a trend we expect to continue--and we want to participate in). Here is a list (and brief commentary) on some of our current holdings that have recently been volatile and/or provide particularly attractive opportunities. Shopify (SHOP): SHOP is an attractive growth stock that sold-off hard in October, and then unsurprisingly began to recover in November--gaining +10.5% for the month. If you can handle the volatility (not everyone can) then it has huge upside in the years ahead. Shopify is a cloud-based platform that helps small and mid-sized companies run and grow their business. We recently wrote about SHOP in detail here. Zillow Group (ZG): The market hates that Zillow is expanding its business into "Instant Home Offers," and the shares sold off 10.3% in November. However, Zillow co-founder and executive chairman Rich Barton believes the share price has gotten way too low, and he "put his money where his mouth is" purchasing millions of dollars of shares just last week, that sent the share price higher. Zillow still has to climb higher before recovering its recent losses, but we we believe over the coming quarters and years, Zillow shares will go much higher. Omega Healthcare Investors (OHI): Shares of big-dividend Omega have continued to rise dramatically during the last month (+13.8% in November) as the company works through significant challenges with several of its skilled nursing facility operators. The company remained positive in its lasst 2 quarterly earnings announcements, and the shares have been rebounding from a low base. We recently put sold income-generating calls on the position, and will happily let the shares be called away from us at a higher price. You can read about out Omega trade here. Teekay Offshore Preferred (TOO-B): Our shares of Teekay Offshore preferred stock sold-off in November (-10.6%), and we view this as creating an attractive opportunity to purchase this high-yielder. The dividend yield is 10.4%, and it's higher in the capital structure than the common. We recently wrote in detail about this opportunity here. FerrellGas (FGP) Partners Bonds: Ferrellgas Partners engages in the retail distribution of propane and related equipment sales, and the 2020 bond sold-off 17.4% in November. From a common equity standpoint, we greatly prefer the big-distribution shares of FerrellGas competitor, AmeriGas (APU), and we continue to own those 10.2% yield shares. However, we consider the 2020 bonds of FerrellGas attractive because they offer a very large yield and they trade at an discounted price, especially considering we believe the bonds will continue to pay their big coupon payments and then pay in full at maturity. It was announced last weekthat FerrellGas will be suspending the distribution on its common shares (and the CFO and COO were departing the company); this is good for bondholders because it frees up more cash to support the bonds (bonds are higher in the capital structure than stock). Despite the challenging debt situation (FerrellGas has a lot of debt), the company continues to generate positive free cash flow and the assets have value. The equity has zero appeal to us, but we like the debt. Transocean (RIG) 2038 Bonds sold-off 10.6% in November, thereby creating an attractive buying opportunity in our view. As a deepwater driller, RIG is sensitive to oil prices, and the recent oil price decline has pressured RIG bonds lower. Transocean has easily survived much lower oil prices in the past. We view this as an attractive buying opportunity if you like income and capital appreciation. International Business Machines (IBM): IBM gained 9% in November. Even though its business has struggled to grow in recent years, its powerful long-term legacy business gives it attractive revenue (and dividend paying power) for many years into the future. Plus, IBM's recent decision to purchase RedHat (RHT) finally gives it some attractive growth potential from here (in addition to its steady and powerful legacy business). General Electric (GE): No one's investment track record is perfect (they're either lying or inexperienced if they tell you it is), and we caught a falling knife when we invested in GE months ago. We acquired the shares after we sold an income-generating put option, and the shares got put to us. We were anticipating a dividend cut when we sold the put options (that's why the premium income on the puts was so great), but we were not expecting the dividend to be cut twice, now siting at only $0.01 per quarter. It seems the selling pressure on these shares may finally be coming to an end as dividend investors have largely abandoned the shares, and it is finally positioning itself for some growth and share price upside. Despite the challenges in recent years (legacy financial crisis assets and sales, a 3rd CEO in the last 18 months, for example) GE remains a powerful revenue generator that can finally focus on growth without the distraction of dividend uncertainties. Digital Realty (DLR): This 3.5% dividend yield data center REIT gained 11.4% in November after selling-off in October. Revenue and earnings continue to grow as the overall data center industry does too. DLR delivered Q3 Funds From Operations "FFO" of $1.63, beating estimates by a penny. The company delivered revenue of $768.92 million missing estimates by $4.82 million, but still a +26.1% increase on a year-over-year basis. This is a healthy growing business, benefiting from a powerful secular trend (i.e. growth in cloud computing). In our view, the overall market remains healthy in the long-term, however it is the near-term uncertainty that has created the volatility. The so-called "trade war" with China, the Fed's increasing hawkishness, and the uncertainty around the mid-term elections all created uncertainty but won't derail this economy. Afterall, GDP is still growing, unemployment is low, President Trump and China have agreed to a temporary trade war truce, and the Fed's last statement was less hawkish--all good news for stocks. We believe many growth stocks are particularly attractive right now, especially considering they've generally sold-off significantly more than value and income securities during this latest bout of market volatility. And select value and income securities are always attractive--such as the ones that we own in our investment portfolios which continue to deliver very strong long-term performance. Lastly, we cannot over stress how important it is for you to know your own personal goals as an investor. If your goal is long-term capital appreciation, then you should probably have a good portion of your nest egg in attractive individual stocks (such as the ones in our Disciplined Growth portfolio). But if your goal is low volatility income, with a shorter investment time horizon, then you should probably consider holding more lower-risk bonds, select preferreds, and/or more cash. Be smart--know your goals--stick to your strategy. Long-term investing is a proven strategy for success.